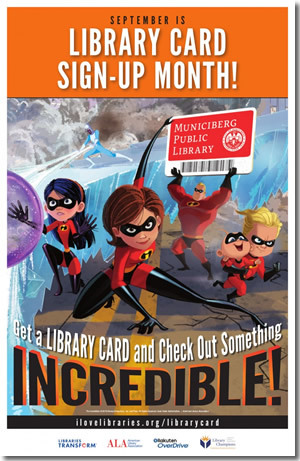 As honorary chairs of Library Card Sign-up Month, Disney Pixar's superhero family, the Incredibles, are using their superpowers to promote the value of a library card this September. Library Card Sign-up Month artwork and media tools are free and can be downloaded from ALA's Library Card Sign-up Month webpage. The webpage also includes media tools for libraries to help remind the public of all the resources available with a library card. Posters, stickers and bookmarks "starring" the Incredibles are available for purchase through the ALA Store. Library Card Sign-up Month is a time to bring attention to the supportive role libraries and librarians play in transforming lives and communities through education. Since 1987, Library Card Sign-up Month has been held each September to mark the beginning of the school year. During the month, the American Library Association and libraries join together in a national effort to ensure every child signs up for their own library card. “Incredibles 2” was released in theaters on June 15. Helen (voice of Holly Hunter) is in the spotlight, while Bob (voice of Craig T. Nelson) navigates the day-to-day heroics of “normal” life at home when a new villain hatches a brilliant and dangerous plot that only the Incredibles can overcome together. This past May, the new picture book “Incredibles 2: Sweet Dreams: Jack-Jack” was released. It follows the youngest member of the Incredibles – Jack-Jack – as he makes mischief.